The most popular rifles on the market are the .308s. They are also some of the most accurate. Scopes are a great addition to an already accurate rifle, and can be very helpful when you are out hunting large animals like deer and elk. If you are in the market for a scope, here are a few things to look for when you are shopping for a scope, and a few reviews to help you get started. When you are looking for a scope, it is important to think about your needs as far as durability, distance capability, and cost. These features can vary so it is important to figure out what you want first, and then what you will be able to afford. A .308 rifle is already made to shoot far distances, so if you are also getting a scope, make sure it is designed for shots of at least 300 to 500 yards, or even more. If it is accurate for fewer yards than that, and lacks high magnification clarity, it isn’t going to help the rifle work any better at far distances. There are some great short range scopes that you can use on a .308, but those just aren’t going to be the best scopes that you can purchase for most situations. Clarity becomes an issue when a scope isn’t showing a distorted view with long range magnification, and it should give you a clear image with conditions that are either low light or bright light. Obviously, durability is going to be a big plus for any scope you purchase. Make sure the lenses are scratch resistant, and you will want the tube of the scope to be solid and sealed. Nitrogen and argon normally fill the scope to make it fog resistant, which makes it more durable, and protects the scope’s interior. Also pay attention to the material the scope is made of for durability, shock resistance, and if it can withstand the jarring of the bolt when it is locked into place. A scope is not something you want to replace often, so it is important to make sure it is a quality piece that is made to last. Since the scope may weigh a little more depending on the material it is constructed of, you need to figure out how to balance it. Scopes that are used for short distances are lighter, and more compact compared to ones used for long distances. Your scope should also be easy to use, and it shouldn’t be difficult to decrease or increase magnification, or take a really long time to sight them in. it also shouldn’t need to be sighted again one you have shot a few rounds, this can be a pain if you are hunting at long range, and you miss your target completely. You also need to make sure you have a clear reticle, and comfortable eye relief, if either of these are not right, you will have a difficult time using your scope. You will also need to be able to easily read the dials, and be able to adjust them. Another important part is the diameter of the objective lens. The larger the diameter, the larger the field of view which means you it is easier to track your target. If you are having a hard time tracking your targets, then you scope is not easy to use. This is one of the most important parts of a scope. A larger lens is called an objective lens, and you will find it the farthest away from the rifle stock. It works by transmitting light back through to the ocular lens, which you will find the closest to your eyes. The diameter of the objective will limit the amount of light that enters the scope, and how efficiently the light will transmit across the ocular. You will find the objective lens in the objective bell, while the ocular lens is in the eyepiece. You will usually find most scopes are fog proof and waterproof. These scopes work similar to a telescope, and they come with a cross-hair, or a reticle, that shows you where your shot will land when you pull the trigger. This is the measure of how much larger objects will appear through your scope in comparison to what you see with the naked eye. If it is a 10x magnification, it will be ten times closer than what you would see normally. You will also find that a scope has either fixed or variable magnification. When you have variable magnification, you will start on a lower magnification and work your way up. Starting with a really high magnification when your target is at close range will narrow your field of view, and lessen the amount of light that enters the scope. This makes getting the shot more difficult. This is the area you see when looking through the scope from right to left. When you have a wider FOV, you will get a lot better results. As you increase your magnification, your field of view will actually get smaller and vice versa. The Nikon M-308 Riflescope was created specifically for a high caliber long range rifle like the .308. It has a 42 mm objective lens, and it has a great field of view with around 25 feet at top magnification. It weighs just around a pound, but it is a one-inch tube with sturdy construction that is pretty typical for a .308 scope. It’s a great length for a .308 at about a foot long, particularly for elk and deer hunting. This fog proof and waterproof scope is great for any type of weather condition, plus it has a 95 percent light transmission, so it can be used in both dim and bright light. It is easy to adjust with an adjustment of only .25 inch making it great for both long and short range accuracy. The M-308 has about a four-inch eye relief that makes it very comfortable to use. It is also very durable which makes it great for a 308 AR, and it is also terrific for a.308 that is used for large game hunting, or target shooting at a long distance. With a BDC 800 reticle, you can adjust the M-308 for the trajectory of your rifle. The BDC 800 was specially designed for the .308 so it has 100 yards zero on the crosshairs, plus 200 to 800 yards representative points. BDC means “bullet drop compensator”, and is another way to say the trajectory adjustment of the bullet from the effects of gravity, which is important when you sighting in the scope and shooting it. The M-308 also has side focus, custom turret, and a parallax adjustment. One of the negatives with the M-308 is that it doesn’t always have mounts, so you should purchase those separately. It’s a moderately priced scope, but it should last you awhile, as long as you take decent care of it. The Bushnell Elite 6500 is a high-quality scope that works really well with a .308. It is solid and durable, and can handle a .308’s recoil easily. It’s also great to use with bolt action .308 rifles. 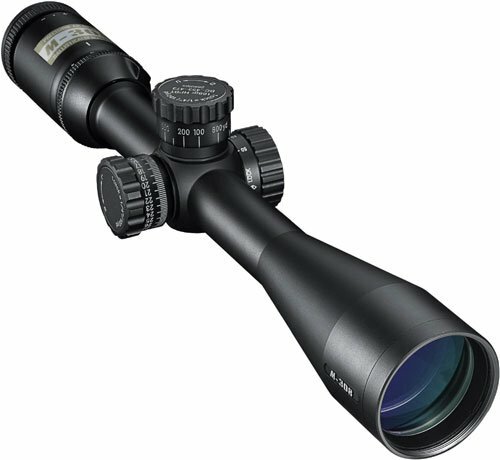 The Bushnell Elite 6500 has really clear and consistent optics that have a durable coating for use out in the field. It’s also nitrogen filled, shockproof, fog and waterproof. Moisture just beads up on it so your focus will always be clear. It has push and pull turrets, and sighting is quick and easy since it is zero resettable. The Bushnell Elite 6500 is ¼ MOA, and has both resettable windage and elevation adjustment, plus a sunshade and side focus. The mil-dot reticle helps to improve accuracy at large distances, and the clarity, field of view, and ease of sighting are excellent, plus it is durable and is easy to adjust. It’s a great scope for a .308, and gets an average shooting distance of 100-200 yards to 300-600 yards. One negative is that if the scope is correctly mounted onto the tube making it level with the barrel, it will be slightly off target. It’s a great scope for someone with experience using a tactical scope, but it could be a bit expensive if you are just a beginner. The Leupold 115390 Mark AR is a high-quality rifle scope that is reasonably priced, and is the best of the Leupold scopes for a .308. It has a Mil Dot reticle that provides better accuracy, and has an eye relief between three and a half to four and a half inches, so it is super comfortable to shoot with. It weighs about one pound, and is around a foot long. It is Argon and Krypton filled making it fog proof, even if you take it from a warm interior area out into a cold vehicle. It also has multi-coated lenses that are waterproofed, and it has a shockproof design that holds up to the heavy recoil of a .308. This scope has great, vivid color transmission, plus clarity of view. Because of the mil dot reticle, it can be used for tactical use, but it is still a good scope for beginners. The mil dot also has both vertical and horizontal scadia. Zero-resettable turrets are offered by Leupold that were created just for the .308 rifle, which makes it easier for the .308 owner. Leupold also offers turrets that are specifically for the .308 rifle. This scope is super easy to use due to the terrific optics of the Mark AR Mod 1. You will find it easy to find the target, and, after you have it sighted in, the mil-dot reticle will make it super easy to estimate shooting distances. It also comes with instructions for sighting in the mil dot reticle. The turrets are in 1/10 mil adjustments, which are a military standard that is easy to master once you understand what it is. The maximum magnification is 8.6 for the Leupold 115390, which is a bit of a negative. It also doesn’t have a lit scope, but the light transmission is clear, and it works well in low light conditions as well. This scope is a really good value for the price. It’s only drawback is that the mil-dot reticles takes a little getting used to, and some extra practice to master. The FSI Sniper Kit has awesome optics at a reasonable price. The FSI Sniper Kit provides owners with a high powered scope that has six to twenty-four power magnification, a red/green illuminated reticle, and a 50 mm objective lens. The illuminated reticle lets you see your reticle in low light conditions so it is perfect for fitting on a .308 hunting rifle. One of the negatives that reviewers have reported is that it doesn’t stand up to recoil very well. Otherwise, the FSI comes complete with mounting rings and a sunshade making it one of the best deals on the market for the price. The UTG SWAT Compact Rifle Scope is a great compact scope that works well with a .308. It has a lot of high-quality features that include a sealed nitrogen purged tube, an illuminated bullet drop reticle, plus fully coated lenses. It also has integrated sunshade, target turrets, a lifetime warranty, and was built to be water, fog and shockproof. The UTG SWAT is a durable scope that is really affordable, and it works well with both a classic bolt action rifle and a modern tactical .308. Some users have reported that it does not hold zero very well, and that the reticule moves once you have centered, so it requires recentering often. Otherwise, if you are on a budget, this is the ideal scope for you that is not only affordable but full of great features. Choosing the best scope for your .308 depends a lot on your budget, and the features that you want. When you have decided how you will be using your rifle, either for long range or short range targets, it should be pretty easy to find a scope in your price range. Hopefully, the reviews above helped you start your search, and gave you an idea of what is out on the market today.